This Asclepiad genus contains five species of smooth-stemmed succulents, that were classified as Trichocaulon before the spiny-stemmed members of Trichocaulon were transferred to Hoodia. Native to Angola, Botswana and the Northern Cape Province of South Africa. Cultivation is difficult. The plants require constant warmth but are moisture sensitive. 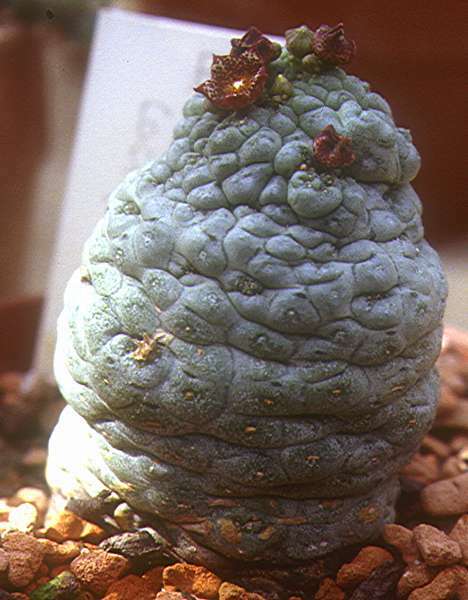 A plump stem succulent forming a short cylindrical column patterened with flattened tubercles. Flowers are reddish or brownish 5-lobed stars often with mottled lobes.